NORF Studios mural titled ‘Family Matters’ is located at the corner of 26th North and Clarksville Pike. NASHVILLE, TN — Many people do not realize the significance that Nashville played in the Civil Rights Movements, but those driving down Clarksville Highway in will now get an idea thanks to the creative work of Norf. The mural depicts an image of Diane Nash, Curlie McGruder, E. Alexander Looby, John Lewis and two children. The theme of the mural is historical, but also the bridge between the old and the new. The strong “strides” represent perseverance and continuing improvement from generation to generation. 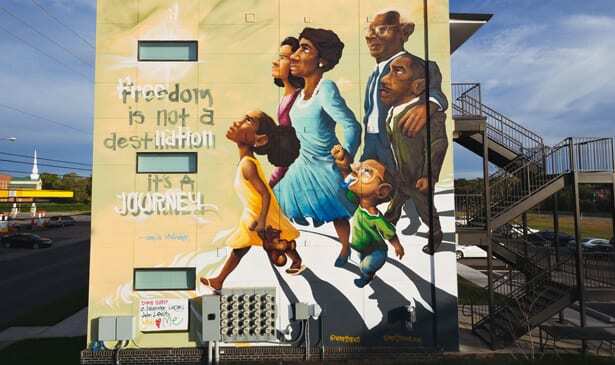 The mural read, “Freedom is not a destination, it’s a journey.” The mural was dedicated earlier this week. the corner of 26th North and Clarksville Pike. Curlie McGruder was a tremendous supporter of Nash and Lewis as they led the desegregation of Nashville lunch counters with sit-ins and organized the “Freedom Rides” in the Jim Crow South. E. Alexander Looby was a lawyer and in this capacity he protected many Civil Rights activists. His statuesque figure in the image serves as an icon for the North Nashville community in conjunction with the neighborhood centers that bear his name. John Lewis was a prominent figure in the Civil Rights Movement and has recently toured the United States speaking about his experience and the changes he played a part in making. “To see my grandmother honored in such a creative way means so much. Hearing her stories growing up, we knew she was something special, but now the city of Nashville will be able to see her influence and impact,” says Jeff McGruder, grandson of Curlie McGruder.